In iOS 10, Messages features creative tools to give users new ways to express themselves and communicate with friends and family. 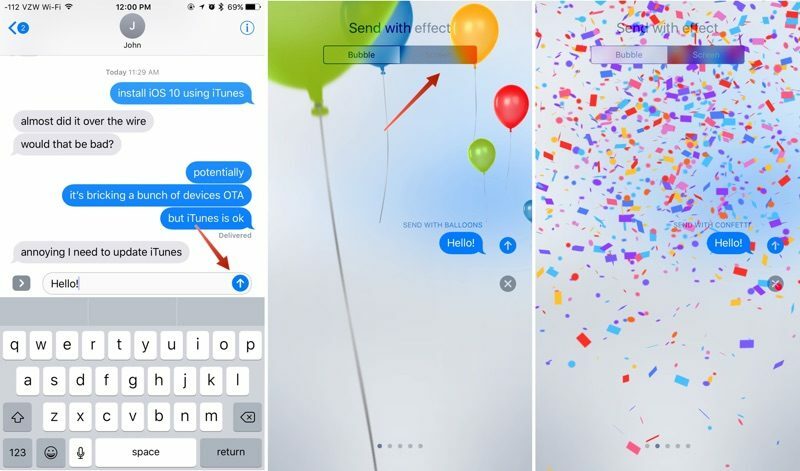 Additions include new bubble effects that change the way iMessage bubbles look, tapback reaction options for sending quick feedback on texts or photos, and screen effects that add fireworks, confetti, and more to the whole messages screen. There are currently four kinds of bubble effects that can be added to chat bubbles to impact the mood of a message: Slam, Loud, Gentle, and Invisible Ink. Each one changes the way a chat bubble looks when it's delivered to a friend. Slam, for example, expands the size of the chat bubble and slams it down onto the screen, while Loud enlarges the chat bubble and makes it shake for a few seconds before it settles down. Gentle, meanwhile, makes the text within the chat bubble tiny for a few seconds before it expands in size, and Invisible Ink, the neatest effect, fully obscures the look of the text in the chat bubble until a finger is swiped over it to unveil it. Open the Messages app and select an existing conversation or start a new conversation. On the iPhone 6s or 6s Plus, use a Force Press on the blue arrow next to the chat box to bring up the Bubble Effect options. On iPads or older iPhones, use a Long Press (press and hold for a few seconds) to bring up the Bubble Effect options. Select one of the Bubble Effect options to see a preview of what it will look like. Press the blue up arrow to send your message. It'll be delivered to the recipient with the effect. 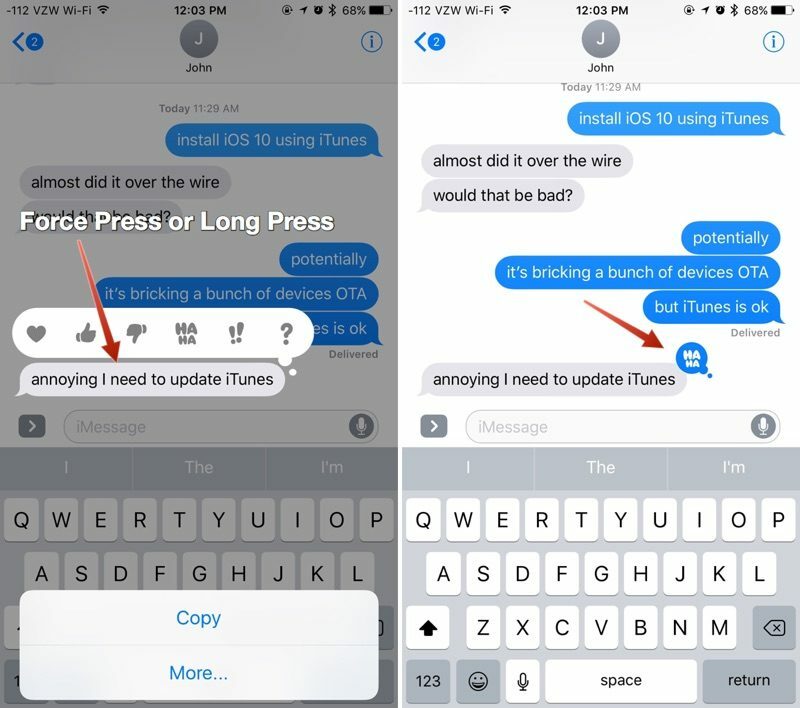 On the iPhone 6s or 6s Plus, use a Force Press (use a long press on iPads and older iPhones) on the blue arrow next to the chat box to bring up the Bubble Effect and Screen Effect menu. The default option is Bubble Effects. Tap "Screen Effects" at the top of the display to change modes. Swipe left and right to cycle through all of the different options. When you've selected the desired effect, press the blue up arrow to send your message. It will be delivered to the recipient as a full screen animation. Screen effects can be added to messages manually by following the above directions, but they're also an automatic effect that's activated by certain phrases. For example, if you text a friend "Happy Birthday!" your message will be sent with balloons. If you send a "Congratulations!" text, it'll be accompanied by confetti. Tapback responses are little icons that can be added to any incoming message bubble, including texts, photos, GIFs, and more, allowing you to quickly share a reaction without having to type a full message. Tapback icons, when used, are added to the chat bubble that was selected and are visible to both you and the message recipient. Tapback options include a heart, thumbs down symbol, thumbs up symbol, a "haha" icon, an exclamation point, and a question mark. Each symbol represents a different emotion or response, which is conveyed through both the icon and the accompanying notification. Choose the message you want to respond to. Long press on the chat bubble. A selection of Tapback icons will be displayed. Choose the icon you want to respond with. The icon is attached to the chat bubble and sent to the message recipient. Want to remove or change a Tapback reaction? Press again and deselect the icon you chose the first time or choose a new one. If you're having trouble getting Bubble Effects and Screen Effects to work, the Reduce Motion setting needs to be turned off if you've turned it on. The feature can be accessed in Settings --> General --> Accessibility --> Reduce Motion. Make sure it's toggled to off, aka not green. With Reduce Motion turned on, Screen Effects and Bubble Effects do not work because they're motion-based. If you don't like Screen Effects and Bubble Effects, turning on Reduce Motion is a good way to disable them. Bubble and Screen Effects are only displayed properly on iOS devices running iOS 10 and macOS Sierra. My mother has an iPhone 6S and she recently updated to iOS 10. She can send messages using the effects and they work when I view them, but messages sent to her using the effects do not work. For instance, if she sends me a text on my phone using invisible ink the effect works on both phones, but if I send her a text from mine using invisible ink she only receives the text along with (sent using invisible ink). Any ideas on how to fix this? I've made sure the "reduced motion" is off so that wasn't it. I love how the example conversations are about iOS 10 bricking devices. Is there anyway to turn off this? Also the drawing and App icon? Ughhh. I wish reduce motion could be a feature by feature selection. Oh well. I'll put up with it now to have these additional message features. Also. It appears bubble and screen effects can only be selected in portrait mode. Kind of wack. If changing reduce motion isn't working, try settings>messages> turn iMessage off and back on. I found the Carlton dance in Messages. That one thing made this the greatest update ever. Try deleting the entire message history with the person whom you're trying special effects with. My Wife could send them to me all day, but could not receive any of mine. We tried all of the above to no avail. I then asked her to delete our entire message thread, she did, then rebooted (not sure if that's necessary) my next special effects text message to her then worked. Not ideal, but it worked. 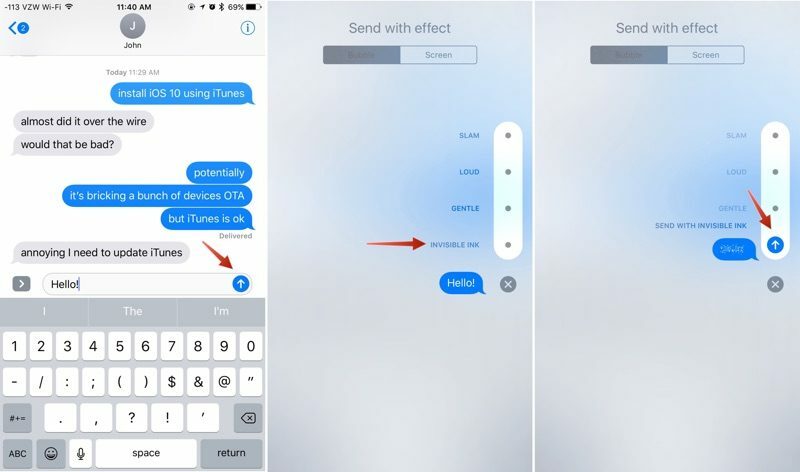 Hey AthiestP3ace, I think this walkthrough of how to send the effects ('http://www.payetteforward.com/iphone-messages-in-ios-10-how-to-send-effects-and-reactions/') might help you and your wife — Also, go to Settings -> General -> Accessibility -> Reduce Motion on her phone and make sure Reduce Motion turned off. Having the same issue yet reduce motion is and has always been off. Seems to be a bug. I'm looking for a similar answer; if there isn't the option to opt in (or out) of receiving effects either globally or by effect or by "conversation"; I'm not inclined to install ios10. These aren't working on my wife's phone. They just when I send them to her she just sees them as text as if she was on iOS 9. Can't figure out why. Anyone see this and know? I've seen a few reports of similar issues. I don't have any insight into a fix yet beyond making sure reduce motion is off as is mentioned in the how to. I'd also recommend restarting. Other than that, it seems to be some kind of bug that'll need to be fixed in an update.